IF there is only one thing I can guarantee today, it’s that you will not go hungry or thirsty at the new Breakers Brunch offering on Saturdays at Radisson Blu Waterfront. It’s quite the event, and begins at 12.30pm; you have until 3pm to consume your own body weight from the buffet stations and pop-up bars. The price options are R550 a person for live music, brunch (buffet starters, mains served at the table, dessert buffet), house wines, local beers, and soft drinks, or R695 for all the above plus a selection of cocktails and mocktails, Fabbri boozy slushies and Prosecco (Italian sparkling wine). The entrance to the hotel’s restaurant, Tobago’s, has been themed island-style. There is plenty of seating inside, but outside is surely where you want to be – the waves break right at the very edge of this area, where there are couches for the brave. In addition, there are lots of tables with umbrellas, and pop-up bars line the perimeter. 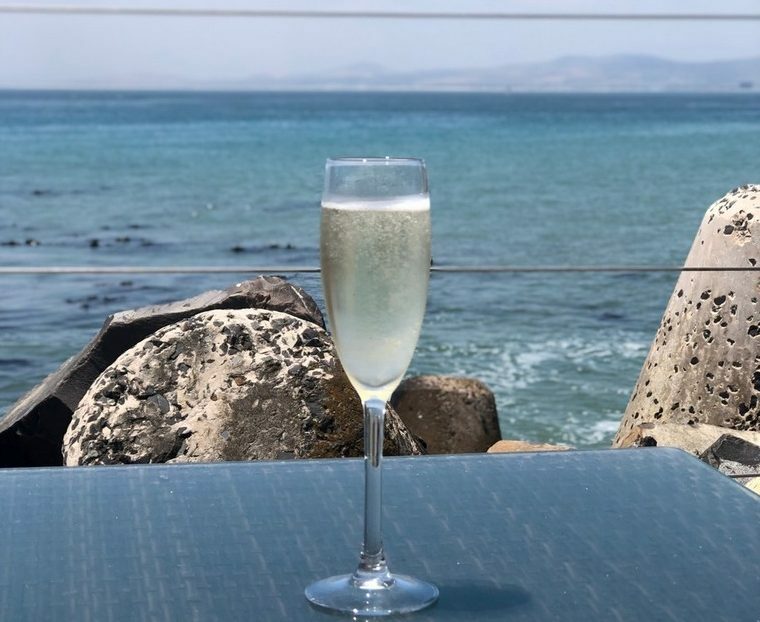 The hotel sits alongside a yacht marina and a breakwater stretch out towards Table Bay, perfect for a little between-courses stroll during your feeding marathon. For starters (just after you are handed your first glass of Prosecco as a welcome drink), there are multiple buffet stations. The unlimited freshly shucked oysters are a big hit, as is the popular sushi guy who keeps those salmon roses coming. There are loads of salads – individual, or build your own; cold meats; cheeses; gorgeous poached salmon; rare roast beef; calamari strips, and much more. If this was all there was it would be enough to keep anyone happy, but next up are main courses. You get to choose an amazing three proteins and two side dishes. Each! It does sound like a lot but the portions are relatively small so you can easily go ahead and pick your favourites; seafood include prawns and scallops, and on the meat side there is sliced sirloin, fillet steak skewers, wagyu sliders, and chicken satay. Roast potatoes, fries, corn on the cob, roasted veggies and house salad are among the side dishes. There is sufficient variety for you to create your own perfect meal. As for the drinks, you can sit there all afternoon sipping Prosecco with your sushi and admiring the view, but don’t miss out on the cocktails. AJ Snetler, aka The Tattooed Barman, took up residence here recently and told me he is so happy with his new position at the seaside. One of South Africa’s top professional bartenders, AJ has a decade of experience in the industry, during which he has been nominated for and won numerous local and global awards and became an ambassador for global brands. While it will be so easy to eat yourself into a food coma by this point, it’s very important to pace yourself and save some space for dessert. Once again, you’ll be returning to a buffet (which is available from beginning to end so there’s no reason not to get stuck in here first and work the other way, if that takes your fancy) with tables groaning under a spectacular array off sweet treats presented in small portions which encourage you to indulge in lots of different flavours. In addition, there is a chocolate fountain and a doughnut wall – which is what you would expect: a wall filled with doughnuts. A DJ spins tunes throughout and as the mood grows looser and louder, roller skate girls take to the dance floor, as do some of the diners, for a little party to round off the day. * The brunch is weather dependent, and booking is essential. Call 021 441 3000; or send an email to: capetown.foodandbeverage@radissonblu.com. Radisson Blu is at 100 Beach Rd, Granger Bay.